The name “sternocleidomastoid” (SCM) actually tells you a lot about this muscle and its attachments. “Sterno” – refers to the sternum, “Cleido” – the clavicle, and “Mastoid” – the muscle goes all the way up on to the mastoid process behind your ear. 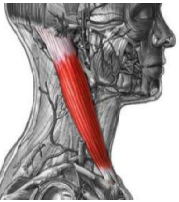 Since these muscles are in the front of your neck and rarely are in pain themselves, people often forget about them. However, trigger points in this area can cause incredible amounts of pain elsewhere in the body. Symptoms created by trigger points within the sternocleidomastoid can be broken up into four categories; referred pain, balance problems, visual disturbances, and systemic problems. - Referred pain. Because trigger points in the SCM are rarely felt in the actual area of the muscle, sometimes, when they are inflamed, they can be tender and often mistaken for swollen lymph glands. It can cause painless neck stiffness when turned to one side, but usually refers pain to the head and jaw. A frontal headache is very common effect of a trigger point within the SCM. Trigger points located close to the sternum in the SCM can also refer pain to the eye socket, tongue and headaches over the eye and ear and in the top of the head. Trigger points nearest to the clavicle can sometimes create a toothache pain in the back molars and in the ear. - Balance Problems. Trigger points within the SCM have the ability to leave you feeling dizzy, nauseous and give you a feeling of falling. This feeling can last for days, weeks, or years, without proper diagnosis. Giving the illusion of other illnesses. It is due the fact the muscle is so close to the head, trigger points in the area can wreck havoc on the spatial awareness which keeps track of the position of the head, making it seem as though you are falling or spinning and send confused signals to the brain. Trigger points attached to tiny muscles within the SCM can also lead to hearing loss on one side (whichever has the trigger point). This is due to those tiny muscles attaching on to small bones in the ear. These trigger points can stop vibration within the ear, ceasing any sound from being audible. - Visual Disturbances. Some trigger points within the SCM can cause blurriness, double vision, reddening of the eye and excess tearing. The sternocleidomastoid muscles are paramount in keeping the head in position. Therefore things such as looking up while looking overhear at something, turning your head to one side for extended periods of time or even looking down, can cause tension and trigger points in these muscles. 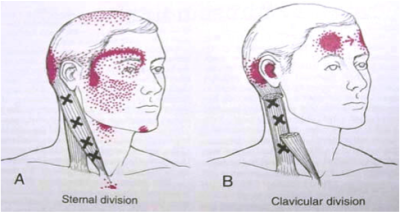 Whiplash can also cause the SCM to have trigger points due to overstretching of the muscle. The good thing about having trigger points in your sternocleidomastoids is that you can treat them yourself. To do this, you need to grab the neck muscles with your thumb and fingers, and knead firmly. If you are paying close attention, you will be able to feel the different layers of the muscle. If the muscles hurt when you squeeze them, you can almost be certain that they car the cause of your headaches or symptom. Every squeeze you give these muscles will benefit them, you will not hurt them. It may hurt you to massage them, but that shows how much they really need working on. Some medical professionals are worried that the massaging of the front of neck muscles can loosen plaque build up in the arteries and cause a stroke. This is not something to be worried about. When massaging, just avoid any area where you can feel a pulse.